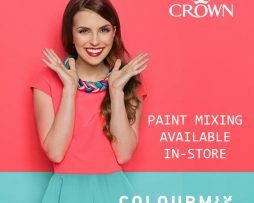 Crown Solo One Coat Gloss is created from a tough durable formula and has ultimate hiding power. The gloss has brilliant reflective quality and is be designed for interior and exterior usage. It can be used on wood and metal in kitchens and bathrooms. A single application is sufficient to get the job done. 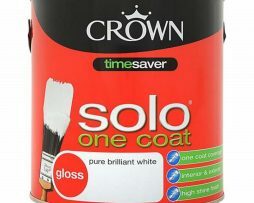 Crown Solo One Coat Satin provides a satin finish suitable for interior wood and metal and is guaranteed to cover in one coat. 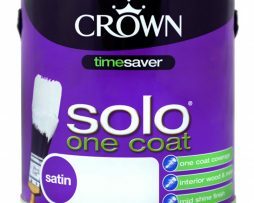 Solo Satin is tough with a durable, hardwearing and longlasting finish. Please see the on-pack step by step application guide for best one coat coverage. Crown Quick Dry Gloss is ideal for use on interior and exterior wood and metal. It covers blemishes in one coat and dries within an hour. The gloss is easy to use with a non-drip formulation, and provides a long lasting finish with a high shine. 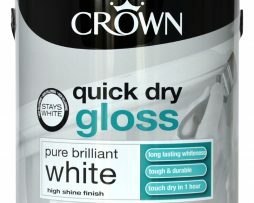 Crown Quick Dry Satin Pure Brilliant White is a durable paint for interior wood and metal. Its non-yellowing, long lasting formula means it retains its bright whiteness for longer. 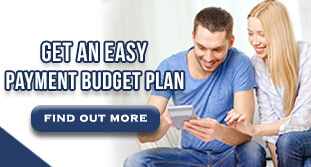 This is a Breatheasy® 99% solvent free paint, so it is virtually odour free. The Mid Sheen finish means it is hardwearing and you can wipe it clean. It is touch dry in just one hour and you can apply a second coat after six hours. It is recommended to apply two coats. This paint is an excellent choice for use on radiators. 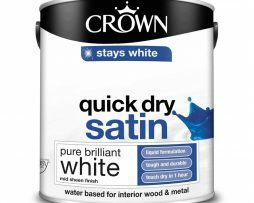 Crown Quick Dry Satin Pure Brilliant White – 2.5 Litre is a durable paint for interior wood and metal. Its non-yellowing, long lasting formula means it retains its bright whiteness for longer. This is a Breatheasy® 99% solvent free paint, so it is virtually odour free. The Mid Sheen finish means it is hardwearing and you can wipe it clean. It is touch dry in just one hour and you can apply a second coat after six hours. It is recommended to apply two coats. This paint is an excellent choice for use on radiators. 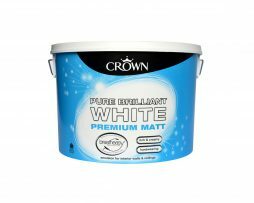 Crown Matt Emulsion Paint in Pure Brilliant White. Matt Emulsion finish to give your walls a modern look with no surface shine. Rich and creamy perfect colour. For use on walls and ceilings. 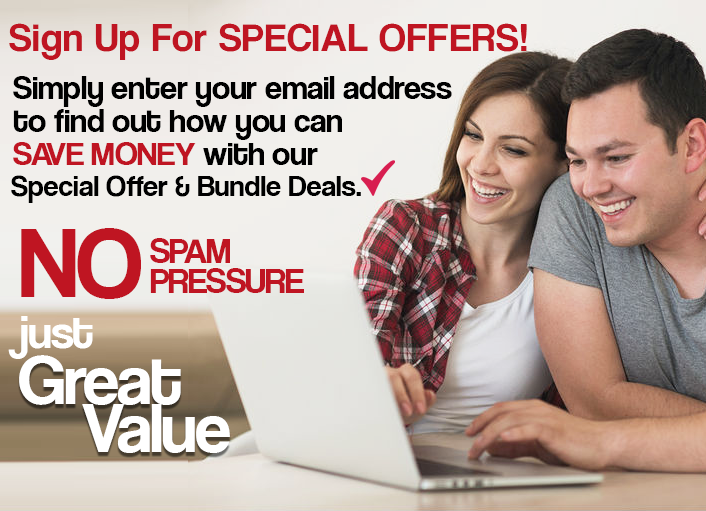 Gives your walls a modern look with no surface shine. Rich and creamy perfect colour. 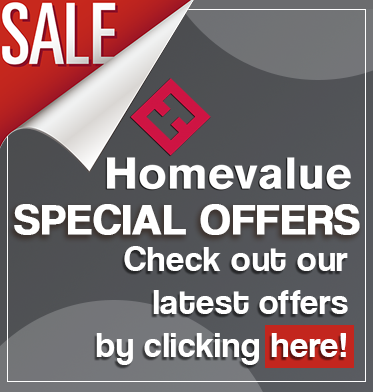 For use on walls and ceilings. Breath easy is 99 percent solvent free. Water based paint. Minimal VOC content. Keep out of reach of children. Always read instructions.